When Admiral Sir George Somers intentionally crashed his ship, the Sea Venture, on the reefs of Bermuda, he likely had no idea what a service he was doing his country. He, along with his crew and passengers, set about founding the town of St. George, which is now the oldest continuously lived-in settlement the UK has in the Americas. St. George's was capital of Bermuda for the better part of two centuries, and when that honour shifted to the centrally located city of Hamilton, St. George's continued to maintain its striking spread of colonial architecture around King's Square (home to the Tourist Information Centre) and along Water Street. Tourism buoys the town today, and most visitors come on a day trip to explore old-world buildings and quaint museums. Within the parish of St. George's are some very appealing beaches and stretches of soft sand, such as Achilles Bay, Tobacco Bay and Clearwater Beach, the latter of which is actually part of St. David's Island. It is worth noting that these beaches generally remain quieter than those on the southern side of Bermuda, particularly when docking cruise ships and their subsequent hordes of passengers are absent. After you have had your fill of sunbathing for the day, the heritage of St. George's can be explored. Somers Garden is an especially pleasant spot and of great historical significance, since it is here where the heart of George Somers is buried. Gates Fort Park provides an enchanting place to sit and relax whilst watching the harbour's busy tug boats sailing between the Town Cut waterway. Reputedly founded on the fortunes of a pirate is the Old Rectory, while St. Peter's Church remains the oldest Anglican place of worship anywhere in this hemisphere. 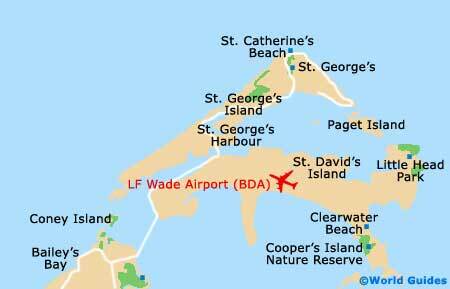 More information about St. George's Tourist Attractions and St. George's Beaches. Historical monuments are peppered all over St. George's Town and many surround the busy centrepiece of King's Square, which is host to the Town Hall and regular walking tours. At the Old State House, the Scottish Free Masons pay rent each April to the national government, only not with Bermudian dollars - just a single peppercorn, as part of an elaborate ceremony. Castle Island is another part of the parish and the remains of a 17th-century fortress lie here, contributing to the town's UNESCO World Heritage listing. In Castle Harbour, the wildlife sanctuary of Nonsuch Island contains a wealth of birdlife. Ordnance is another island and is connected to the mainland by a bridge, where it formerly served as a store for ammunition. 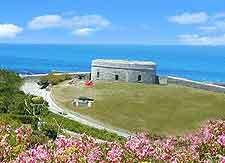 Today, Ordnance Island is home to an important cruise terminal and a recreation of the HMS Deliverance ship, which was built for those who arrived on the Sea Venture and wished to continue their journey. More information about St. George's Landmarks and Monuments. Since St. George's has so much history, it comes with a number of notable museums and related attractions. The Bermuda National Trust Museum is amongst the best on offer and resides within a 16th-century stone building, which is one of the island's oldest. 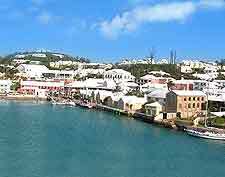 Exhibits include a video showcasing Bermuda's rich history, as well as information and displays about the island's role in the American Civil War, which is documented in the upstairs Rogues and Runners Museum. At the St. George's Historical Society Museum are an assortment of relics from the Pequot Native American tribe, as well as lots of colonial artefacts. 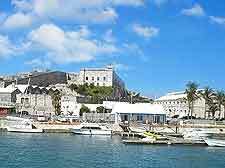 Also worth a visit is the Bermuda Heritage Museum and Fort St. Catherine - the very spot where the crew of the Sea Venture first came ashore all those years ago, changing Bermuda's history forever. More information about St. George's Museums and Art Galleries. The island of Bermuda is relatively easy to find your way around, although do bear in mind that you will not be able to hire a car here. Instead, either choose to zoom around on a scooter, or rely on local buses and taxis. However you decide to travel, day trips to the city of Hamilton are a must, with its numerous parks and main sights including the Cathedral of the Most Holy Trinity, Fort Hamilton and Sessions House. 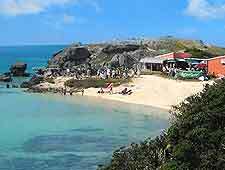 Sandy's parish makes for another popular excursion and features seaside villages, seafood restaurants and the simply stunning beach of Somerset Long Bay. 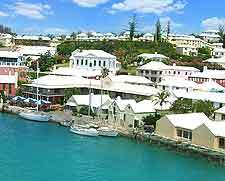 The old Royal Naval Dockyard is a particular highlight in Sandy's parish, with its converted warehouse shops, Bermuda Maritime Museum and Dolphin Quest attraction. 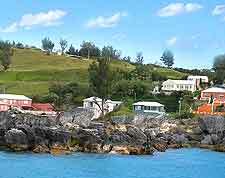 At the parish of Warwick, Chaplin Bay, Warwick Long Bay and Jonson's Cove all deserve some attention. More information about St. George's Attractions Nearby.